We have about 2-3 inches in the snow play areas this morning. I just came back from the snow play areas and the picture was taken this morning at about 9am. Click on the picture for a larger view. The conditions look good. Roads are open with no controls. The temp this morning was in the mid to upper thirty’s. 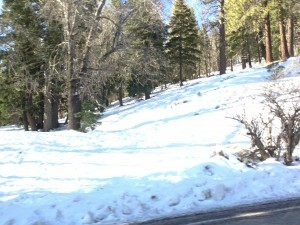 So come on up and get some Snow play in May in Southern California. Should not be any crowded. 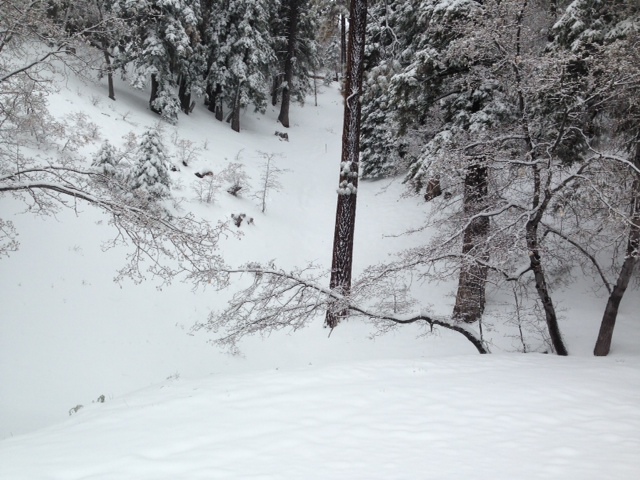 This entry was posted in Snow Play - 2014-2015 on May 15, 2015 by Mike. The Angeles Crest Highway is open. I was just at Vincent Gap and the gates are open. So come on up for a drive and a Great time in the Mountains. Be carful while driving the highway as since it just opened you may see some wild game such as Bighorn Sheep, Deer, Bobcat and Mountain Lions. On my way back to the store I saw 2 deer crossing the road. So come on up and have a great day also swing by Mtn Hardware and say hello. Let us know how you trip was. This entry was posted in Snow Play - 2014-2015 on April 17, 2015 by Mike. The weather is Great. Come on up for a hike, Picnic or a drive in the Mountains. The road to Blue Ridge is open at Inspiration Point. I am not sure at this time how far the road is open but I would image it is open to Guffy Camp Ground. We are starting to get some PCT hikers coming through so if you see someone on the PCT Trail they may be on there way to Canada. This entry was posted in Snow Play - 2014-2015 on April 5, 2015 by Mike. We have snow so bring the kids, grandmother, neighbor kids, and the dog. Enjoy the snow while we still have it. See the pictures from yesterday’s post. This entry was posted in Snow Play - 2014-2015 on March 8, 2015 by Mike. Come on up the snow conditions for SNOW PLAY are GOOD. The road are open with no controls so today would be a great day to jump in the car with the kids and head to the Mountains. This entry was posted in Snow Play - 2014-2015 on March 7, 2015 by Mike. Yes we have GREAT Snow. So come on up this weekend. The weather is blue sky and light wind. I just took this picture (below) this morning. You can click the picture to see a larger view. This entry was posted in Snow Play - 2014-2015 on March 6, 2015 by Mike. We received a light dusting of snow overnight. So the conditions are GREAT for SNOWPLAY come on up!!!!! 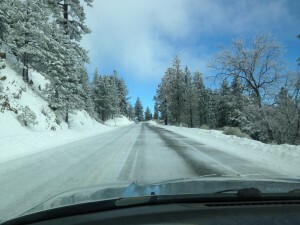 At this time no chains needed to Big Pines but west of Big Pines chains are required. This may change during the day. This entry was posted in Snow Play - 2014-2015 on March 2, 2015 by Mike. From the earlier post the chain control is now OFF from the country line to Big Pines. 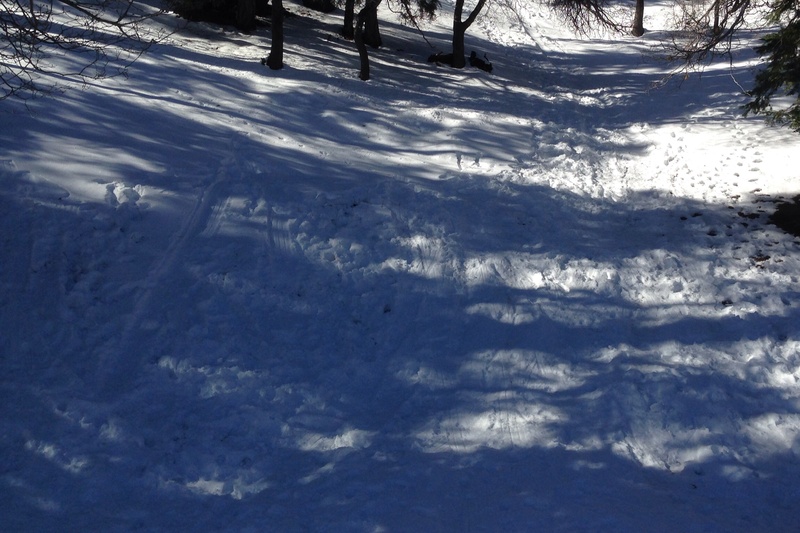 This entry was posted in Snow Play - 2014-2015 on March 1, 2015 by Mike. Yes we received another 3-4 inches of snow last night. The temp.is currently in the low 20’s with cloudy skies. The Weather Service is calling for more snow today. So the snow play conditions are very good. The only problem right now is that chains are required just west of town so if you are coming please be ready to use chains. This condition may be removed latter in the day so if you like you can call us latter for the current rods conditions. Check out the picture you can click on it to get a larger view. The weather is broken clouds with light winds at this time. The weather service is call for a storm coming in today thru Tues. So make sure you plan on winter travel conditions. This entry was posted in Snow Play - 2014-2015 on February 28, 2015 by Mike.